A GROUP CALLING itself the Jewish Internet Defense Force complained bitterly recently about the reinstatement of former Representative David Duke’s video channel on YouTube. 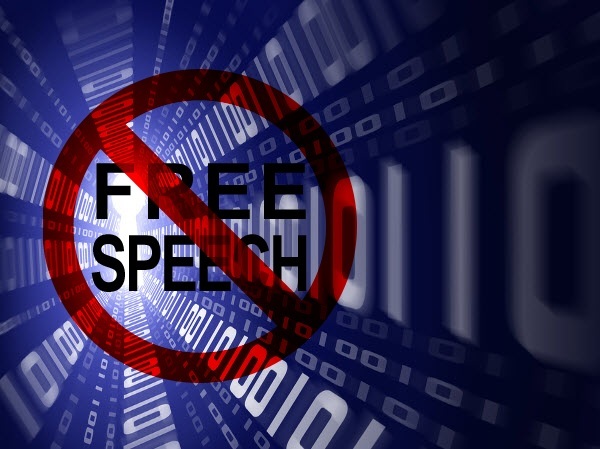 Ironically, the illustration shown here with a red line covering the words “free speech” accompanied the JIDF article opposing free speech for critics of Israel and Jewish extremism. Apparently, whoever is behind JIDF is so obtuse as to simply not “get” the implications. You can view David Duke’s channel on YouTube once again. The JIDF doesn’t believe in free speech on the Internet. Since they apparently can’t argue or disprove Dr. Duke’s points, they prefer shutting him down to the impossible task of defeating him in debate. The truth is that David Duke is extremely knowledgeable, intelligent, and reasonable.The facts he brings to light, primarily from mainstream Jewish sources, are unimpeachable. Millions are hearing Dr. Duke on the Internet: He has had over 1.5 million views on his own channel, and there are now over 2,000 videos of Duke media appearances, speeches, and broadcasts available there for a total of over 11 million views. Dr. David Duke for President 2012!! !